Will you save with off grid power? As electricity prices continue to climb and renewable energy technologies become increasingly viable, more and more households are beginning to ask if it’s worth going ‘off the grid’. Recent leaps in small-scale solar generation and storage technologies have made it possible for households to self-generate a large portion of their energy usage. It’s a great way to save money, and given that Canstar Blue research has found many Aussies are unsatisfied with the value for money they receive from their electricity provider, you can see why solar might be an attractive choice. It might seem like a wonderful idea to exit the grid and become your own electricity provider, but it’s unfortunately not that simple. Creating a self-sufficient property requires a large investment, so there’s a lot to consider before making any bold decision. ‘The grid’ refers to a large and complicated electricity transmission and distribution system. There are four major power grids, and nearly all Australians are connected to one, they are. These grids are managed and maintained by electricity distribution companies – not your electricity retailer. It’s the costs of maintaining and upgrading these grids that accounts for more than half your electricity bill. Falling grid energy demand is making it more expensive for network operators to maintain its systems meaning we could electricity prices rise. So is now time to jump ship? Well… Keep reading. To live off the electricity grid, you will need a reliable solar battery, a large off grid solar system and a backup generator. All up, living entirely off grid will cost at least $25,000, even after factoring in government rebates and incentives. The average Australian household uses between 12kWh and 16 kWh of electricity each day on average. A general rule of thumb with solar is that a 1kW solar power system will produce roughly 4kWh of electricity under ideal conditions – which can’t always be guaranteed. This means in order to cover your daily energy usage, you would require a 3kW – 4kW solar system; if you want to go completely off the electricity grid however, it’s recommended to play it safe and opt for a larger 5kW system. At the time of writing, a 5kW solar system will cost around $13,000 – $15,000, however customers eligible for a government rebate could possibly have the price reduced to around $10,000 – $12,000. The major drawback of solar is that it only works when the sun is shining, so you will need to also install a solar storage battery if you’re to have electricity through the night. Solar storage is relatively new and unfortunately a little pricey right now. If we take a hypothetical person who uses most of their electricity at night, then you might want a storage system of at least 10kW – again, this entirely depends on your energy usage. Prices for a solar system of this size, including installation can often cost anywhere from $12,000 – $15,000. 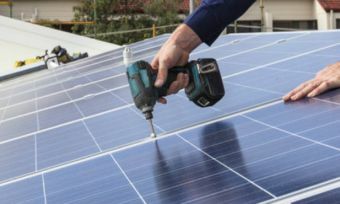 When you combine the cost of installing a solar system and storage unit, as well as disconnection and council permission fees, you can expect an off-grid solar system to cost in excess of $25,000. News Corp published a story about a woman who completely disconnected her home from gas, water and electricity services. The project cost nearly $50,000 in total, with the solar system (panels & battery) alone coming in at $29,000. She expects it will take about 20 years to pay the money back, but insists it’s a good long-term investment. The price of solar systems and storage batteries are tipped to fall in the coming years, so if you aren’t prepared to spend the money now, it may be worth waiting. Keep in mind that you will need to maintain your solar system, which may mean having to spend extra on repair and replacement expenses. Will I save money by going off grid? For most of you reading this, the short answer is no. As nice as it would be to ditch the power companies, household solar panels and storage batteries remain slightly too expensive for going off grid to be profitable. For the purposes of this calculation, we are also making the rather unrealistic assumption this person has a constant energy bill. If they went completely off the grid, and spent $25,000 on a solar system, not including ongoing maintenance costs, then it would take nearly 15 years before disconnecting from the electricity grid actually became a profitable investment. The problem is that most solar batteries are only warranted to last 10 years, and solar panels, 10 to 15 years. That means you may need to replace your entire solar system before it’s even paid for itself. Of course, there are a lot more factors you will need to consider in assessing your personal situation. How sunny is your area? What’s your electricity rate? Do you receive a feed-in tariff? How long do you plan to live at your house? The list goes on. Whether or not you should actually disconnect from the electricity grid depends entirely on your location and personal situation. Generally speaking, even if you get a good deal on your solar installation, it can take decades before you see any decent returns on your investment – and that’s assuming your system doesn’t deteriorate before then. For new houses, not connecting to grid electricity might be an easier choice, since connection is so expensive, but for home’s already connected, leaving the grid is a massive risk. Solar won’t be able to work very well on cloudy days, leaving you without electricity when you might need it most. If you are interested in solar, it’s a safer move to install a capable solar system, but remain connected to the power grid for those days when your solar system is unable to operate. It’s widely accepted that renewable sources of energy will be the way of the future, and as solar technologies continue to improve, the capacity and efficiency of solar systems should improve, while prices fall. Even if it might not be viable for you to disconnect from the grid right now, one day soon it might be.